1.1 Should you upgrade? Let’s compare iPhone 7 and iPhone 8 so we can let you decide if you should by stick with the older iPhone 7 or buy the new iPhone 8. 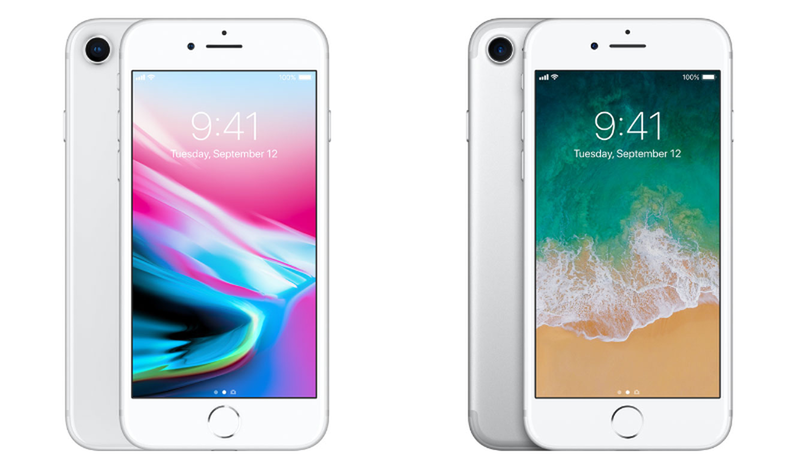 1.2.4 Yes, the iPhone 8 is fractionally larger than the iPhone 7 and over 7% heavier. Why? Because of its most controversial change: the back of the iPhone 8 is glass not aluminium. 1.3.1 Where Apple has improved the iPhone 8 is a 25% boost in volume compared to the iPhone 7’s stereo speakers, though there is no return for the headphone jack with Apple retaining only the Lightning port (some naively hoped for universal USB-C) as the sole port on the phone. 1.4.3 Yes, the iPhone 8 is getting essentially the same performance as the more expensive iPhone 8 Plus and 40% more expensive iPhone X. The difference is less RAM, but the iPhone 8 drives a lower resolution display and only a single rear camera (more in the Camera section) so there should be no tangible difference in real world use. 1.5.1 When it comes to battery life there’s good news and bad news. The bad news is even Apple admits on its comparison page the iPhone 8 only “Lasts about the same as iPhone 7” which in turn was barely better than the iPhone 6S or iPhone 6. Wasn’t losing the headphone jack meant to free up space for a bigger battery? 1.5.2 The good news is when your iPhone 8 does run out of juice, it will charge more quickly as Apple has finally added wired quick charging and followed this up with Qi-compatible wireless charging. 1.6.4 Yes, storage has doubled but prices have gone up as well and there are now only two storage options. Meanwhile Apple has reduced the iPhone 7 by $100, but retained its smaller storage capacities creating a real dilemma between the 128GB iPhone 7 and paying $50 more for a 64GB iPhone 8. Should you upgrade? Let’s compare iPhone 7 and iPhone 8 so we can let you decide if you should by stick with the older iPhone 7 or buy the new iPhone 8. The good news is when your iPhone 8 does run out of juice, it will charge more quickly as Apple has finally added wired quick charging and followed this up with Qi-compatible wireless charging. Yes, storage has doubled but prices have gone up as well and there are now only two storage options. Meanwhile Apple has reduced the iPhone 7 by $100, but retained its smaller storage capacities creating a real dilemma between the 128GB iPhone 7 and paying $50 more for a 64GB iPhone 8.